For international orders we use a combination of couriers including DPD, Royal Mail or FedEx. Our couriers ensure that your goods are correctly signed for thus ensuring that your parcel is in safe hands. Jules B does not accept liability for any delivery instructions issued to the delivery company by the customer. If you leave instructions requesting a parcel to be left in a location (eg shed, garage, neighbour etc) we cannot accept responsibility if you fail to receive your parcel. If your order is returned to sender due to multiple unsuccessful delivery attempts, you will be liable to pay the return delivery charges. Your purchase is insured if your parcel is lost/damaged/stolen whilst in transit and under the care of the couriers. Once the parcel is signed for then it is no longer covered under this agreement and the responsibility of the parcel and its contents falls to the recipient that signed. To avoid delays to your order, please ensure that your billing address matches the address on your card statement and that the card holder's name is written as it appears on the card. Please ensure that your contact details are filled in accurately so that we can contact you if necessary. For security reasons, customers may also be subjected to standard fraud prevention checks which could delay your order. If you have any additional questions surrounding delivery please contact us on +44 (0)191 211 2330. 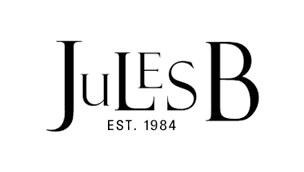 All products are shipped from the United Kingdom and it is important to note that you may have to pay customs duties and taxes on the items you purchase outside of the EU and that these local fees are not included in your Jules B invoice. Jules B is unable to predict these charges and we recommend contacting your local importing office. If your order is returned to sender due to multiple unsuccessful delivery attempts, you will be liable to pay the return shipping charges. Please contact us at customercare@julesb.co.uk if you have any worries regarding duties, taxes and fees after speaking to your local tax office.